If I had a dollar for everytime someone asked me how they could extend themselves online, I’d be super-rich. Well, maybe not super-rich but definitely rich. Tweet chats on Twitter is an amazingly great way to connect with new people and extend your brand on that platform. There are tweet chats for just about every topic under the sun. They can move fast, but are always centered around a hashtag (see above). Whenever I’ve participated in a tweet chat, I’ve always walked away with more followers and more exposure to my brand. The best site to use when participating in a tweet chat is www.tweetchat.com. To find a chat to particpate in, check out Tweet Reports, Twubs, or this Google Spreadsheet. Finding a like-minded and focused business to partner up with can expose you to a brand-new audience. Of course, make sure it’s not the competition, but finding a business that targets who you want to target can open new doors. A no-brainer example would be photographers and florists. Doing joint blog posts or sharing each other’s social media posts will put each of those businesses in front of each other’s audiences, thus extending their reach to a whole new fan base. Business partnerships like this can usually be mutually beneficial. Just make sure you’re not doing all the work. You can put as much or as little time into each of these three ways as you want. Each of these will extend your reach on social media and expose you to brand new fans. Have you tried any of these and had success? Comment below and share your experience! This post was written for The Southern C and has been republished with permission. Instagram is on the rise. This image-based platform topped 300 million users in 2014. More and more businesses are taking advantage of this awesome platform. In fact, this is one I’m trying to use more of this year, both personally and professionally. I’d like to know “how to” promote my portrait photography on Instagram. How do you post photos files other than those taken with your phone? So far, the only suggestion I’ve seen is to upload them from box. I just started using Instagram and so far the only posts I see are the ones I “follow” instead of everything posted. So how do I know if my posts will be seen by everyone? Like any other social media platform, you have to use it regularly to benefit from it. Posting once per week is not going to do it. Plan on posting 2-3 times per day. The more active you are, the more your account with grow. Last but not least, you need to be able to track and measure your Instgram effors. Fortunately there’s a great program called Iconosquare to help! This program lets you manage comments on your Instagram photos, manage your account by providing you widgets and badges to let people know you’re on Instagram and gives you data on who is following you and optimal times to post. Do YOU have a social media question you’d like answered? Just write in your question on our Ask Mandy Q&A page! Lead generation is important for any business. Without leads (or referrals as they are sometimes called) you would have nowhere to start. Leads (referrals) can come from friends and family or a business organization or even online via social media. You may have a portion of your clients that found you on their own but at some point every business will have to go after clients, either through advertising, social listening or your traditional sales call. Recently I was asked to list out some ways that people could use social media for referrals. As I created the list I realized that are numerous ways one could use social media for lead generation. I know I am not inventing the wheel here, but these are common ways people are using social media to generate leads. Use social media to create that relationship and build trust & loyalty. Post QUALITY content that shows you are an authority in your industry and you really do know what you are talking about. After time (this doesn’t happen immediately), you will have people approach you to hire you for your services. I recognize this is a long-term plan, but it’s highly effective. Use Twitter’s advanced search to search phrases that relate to your industry, really listening to what the general public is searching for. Example: You are an insurance agent. You go to Twitter and search “my rates are too high” or “I am so mad at my insurance agency”. You can search worldwide or locally. Reach out to those who are complaining with a simple “Hey! I saw you are unhappy with your rates. If I can ever be of help, just let me know.” You do NOT want to start off with a sales pitch, just broach the topic gently. Have a LinkedIn profile that is completed to 100% and connect with those you are in your target market. ALWAYS, ALWAYS, ALWAYS create a personalized connection message. Do not use the generic, standard message. You are trying to reach out and connect, so personalize it. Take advantage of LinkedIn groups – join those that are industry-relevant or those that target your target audience. Be careful not to spam or give a hard sell to these groups. Most have rules against it. The more you are out there, the more people will see you and request information for your services. If you choose not be active (and I’m not sure why you would) how will people find you? Take advantage of Facebook ads. Facebook ads give you the ability to target the specific person you want to reach. Using their Power Editor can give you even more targeting options. Have an opt-in on your website and promote it through social media. For those unfamiliar with opt-in, they are something of value that people will give you their email address for. Example: You are in pest control. You have a place on your website for people to get a copy of a white paper you have called “10 Simple Ways to Keep Your Home Bug-Free”. People would give you their email address and in return, they would receive this piece. You then have their email address to contact with new customer specials, on-going offers and general information. Opt-ins can be promoted with a Facebook ad directing them to sign-up on a custom tab on your Facebook page, a sponsored tweet with the link, or just a simple post on your various social media profiles. There are many, many ways to generate leads using social media so these 7 are not the end-all. Let me ask you, how do you generate leads via social media? Do YOU have a question about social media for businesses? Simply click here to ask! Don’t miss out on our weekly Q&A! You can subscribe to receive these via email here. There is no such thing as true balance. Yes, as much as we’d like to achieve balance in our life it doesn’t exist in the form we like to think. Balance is what ever makes you happy, not devoting a certain number of hours to X and Y. In all of our lives, balance is not the ultimate goal, it’s just an average of what you are doing. What balance is to me means something completely different to you. We all juggle multiple things at once in our lives – businesses, kids, spouses, friends, charities, etc. To say you are not trying to do it all is a lie. I’ll fess up – I can be an absolute mess at times. I’m married, have 2 daughters (ages 10 and 6), own my own business and am involved in my community. Late nights are nothing new. Taking my stress out on a punching bag is my norm. There are days that I’d rather roll over in bed than be productive. Life keeps going and so must we. At the Professional Women’s Conference I attended there was a panel devoted to this topic. They called it the “Balance Games” because essentially that is what it is, a game. There were several great takeaways that we can all use to achieve whatever balance we are striving for. Be 100% focused on whatever you are doing at the moment. It doesn’t matter if you are pushing your child on a swing or writing a business proposal, be 100% focused on the task at hand. Your child or partner will remember the undivided attention you gave them. You will also find when you are 100% focused on what you are doing, you’ll be more effective and efficient because there won’t be anything to distract you. Learn to unplug and put the electronics up. This is hard, but you just have to unplug at times. We can frequently go into information overload and working in social media, it happens more than I care to admit. When your business is 24/7/365, it’s hard to unplug but trust me, you just got to. Your eyes, mind and family will appreciate it. After a refreshing break, you’ll find yourself more focused and ready. Just say “no”. And do not feel you have to explain why. You do not have to agree to everything. There is not enough time in the day to be superwoman (or superman). Busy makes us feel important, when in reality it doesn’t. We choose to be busy. We think if we go on and on about what all we have to do, we will be perceived as being someone important. We have to prioritize what we do. It could be your children, your spouse or something else. When you do say no, unless specifically pressed, you do not have to explain your reason(s) why. It’s no one’s business but your own why you are declining something. Only you have the power to say yes and no. No one else speaks for you. Do not concede to putting it in someone else’s hands. You have more power than you think. Draw the line and defend it. Being a working mom, I have boundaries. You need to have boundaries too. You need to know what you will and won’t do and defend that. This could be time with your kids, ethical business situations, things that pertain to your religious beliefs. We all have lines we won’t cross and when tempted, we need to defend it. On the same lines, find your family time and defend it as well. If your family time is from 5-8pm, for example, do not take phone calls or work during that time. Sometimes that balance means turning clients down. Remember, if they want to work with you bad enough, they will work with you on this. Success is finite; aim for significance. Success can be a new client or an award. Significance means you made a difference. We all want to have success, but that really only lasts so long. Aim for something that you will be remembered by. If you are too caught up in the everyday busyness of our lives, we’ll never achieve that long-term success (significance) we are looking for. What do you think? What are some ways you stay sane in your crazy life? Ask Mandy is a weekly Q&A blog series. To ask your question about social media, please click here. Everyone wants to be successful in whatever they do. Success could mean an important job title or it could mean a lot of zeros on a paycheck. Success could be staying with the same company for 10+ years or it could be simply doing something that makes you happy. Regardless of what kind of success you are working towards, it doesn’t come easy. It requires blood (sometimes literally), sweat and tears. It means staying up all night to finish a project. Missing some of your children’s activities. Putting off a large purchase. To modify a quote from one of my favorite TV shows, success comes at a price. YOU determine the price by how YOU define success. It doesn’t always mean $$$. I recently attended a conference where the branding (reputation) panel discussed success and your career. It was a brilliant panel of veteran businesspeople. Each brought their own experience and intrepretation. Five key statements stood out to me as how to be successful in your career. 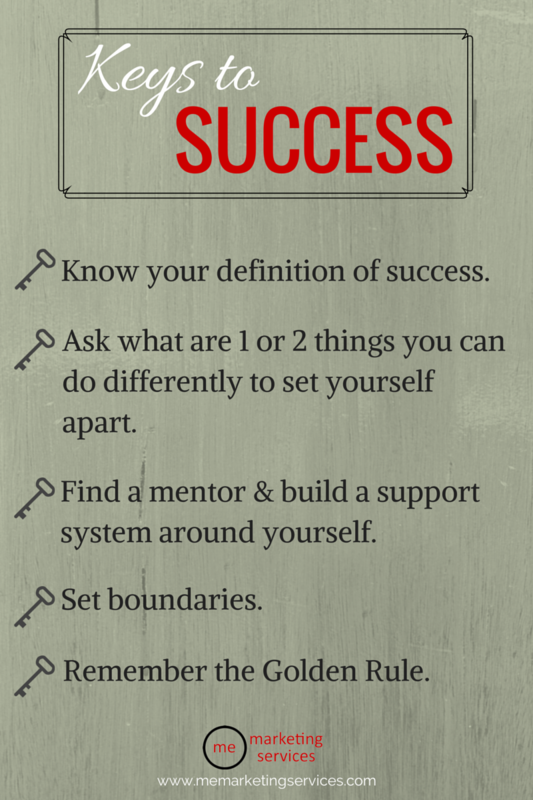 Know your definition of success before you do anything else. It’s been said birds of a feather flock together. If that’s your case, how will be people know who you are? In a competitive business world, to be noticed you have to stand out. It could be from your hard work, your job title or who you know. Ask yourself – what is your “it” factor? You aren’t born with “it”, you have to develop it. What sets you apart from the other birds? I cannot stress how important this is. How you treat others says a lot about your character. Go into everything treating other people how you would want them to treat you. It may not work all the time, but you’ll be able to sleep at night. One thing to ask is how can you serve others? By serving others, you’ll see your generosity come back to you. This can range from giving a college student an hour of your time to mentor them. It could help with your organization’s fundraiser. This could simply be showing compassion. Do you have what it takes to be successful? What attributes do you think a successful person needs?